The California wine you’re drinking might say “Cabernet Sauvignon” on the label, but 99% of the time you’re also tasting other grapes in that particular vintage. Although it’s much easier in America to determine what grape variety you’re drinking from the label, it would be more accurate if it said “Mostly Cabernet Sauvignon” because like the great winemakers of Bordeaux, American winemakers like to blend; and that’s a good thing. 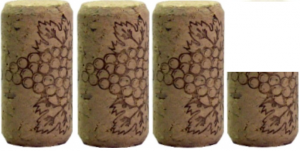 By rule, a California wine can be labeled Cabernet Sauvignon as long as it has at least 70% of the juice coming from Cabernet Sauvignon grapes. Any less than that and it has to be called a “Red Blend,” or something similar. Many of these red blends from Napa taste just as good as a Cabernet, but don’t fetch as high a price, so it’s in the best interest of the winemaker to try to adhere to the rules, or lose money. This week’s featured wine is labeled Cabernet Sauvignon, but it’s actually a blend of two other grapes, too: Merlot from Sonoma, and Cabernet Franc from Mendocino County. 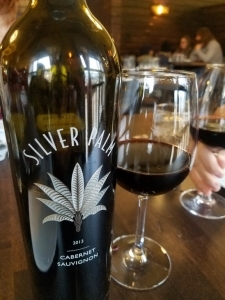 As a result, the Silver Palm Cabernet Sauvignon impresses with rich blackberry aromas, soft black cherry flavors, toasty oak and a lightly spicy finish. This was on a restaurant wine list and was basically the only Cab available, so I had no idea what to expect. Thankfully, it went very well with my steak that evening, so when I saw it in the store a few weeks later for $16, I picked up a bottle and enjoyed it a second time. On my five cork scale based on taste and value the 2013 Silver Palm Cabernet Sauvignon from Jackson Family Wines gets 3.5 corks. It’s a solid performer that you can find for under $20 just about everywhere. It was also Wine Enthusiast’s 90 point Editor’s Choice. If you’d like to try interesting wines like this, please join me at our next private wine party at Ferrari’s Little Italy! I host a wine dinner there every month and we feature several interesting wines, paired with a delicious meal. There are always cool prizes to win, too, so listen Wednesday at 4:15 to win your spot on the guest list, or click here for a chance to win!